A vision statement describes what a company desires to achieve in the long-run, generally in a time frame of five to ten years, or sometimes even longer. It depicts a vision of what the company will look like in the future and sets a defined direction for the planning and execution of corporate-level strategiesCorporate StrategyCorporate Strategy focuses on how to manage resources, risk and return across a firm, as opposed to looking at competitive advantages in business strategy. Let’s look at Microsoft Corp.’s Vision Statement. Microsoft Corp. is an American multinational company that develops, manufactures, licenses and sells technology products, including computer software, electronics, and personal computers. 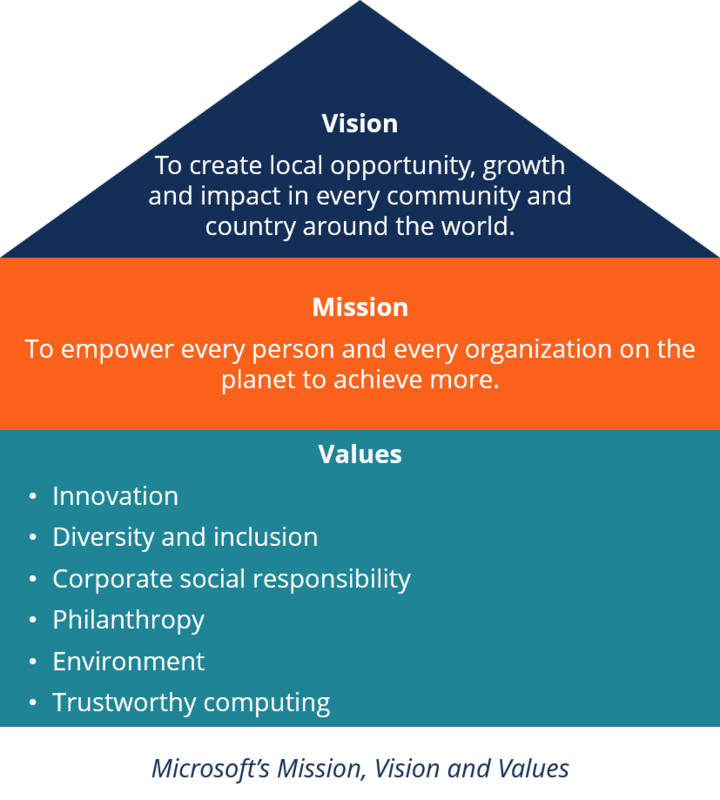 It is also one of the largest corporations in the world, alongside companies such as Apple, Inc. and Amazon.com, Inc.
Microsoft’s vision statement is a forward looking because delivering growth and impact in every community would conceivably take a lifetime or many lifetimes to achieve. It also brings the message of leading to changes and improving quality of living standards all around the world, which strongly reflect Microsoft’s values of innovation, diversity and inclusion, corporate social responsibility and environment. The mission statementMission StatementA mission statement defines what line of business a company is in, and why it exists or what purpose it serves. Every company should have a precise statemen, vision, and values are traditionally the three most common description of a business which explains why a company exists. In recent years, another type of statement has also emerged in the business world and is gaining more popularity. This type of statement is called the Purpose Statement. A Purpose Statement conveys a company’s reason for existence, just as the mission statement and vision do, but it also shows the connection between the brand identity and workplace culture of the company. It combines the components of a mission statement, vision, and values into a single statement. Thank you for visiting our resource on how companies can use a vision statement to help support their overall strategy. To learn more about strategy, check out our Corporate & Business Strategy course, which covers all important terminologies and theories on strategy and demonstrates the whole strategic analysis process.